I am going to try to shed some light today on the concept of binaural beats. These are not to be confused with the really expensive headphones marketed by a music star. These are the mind’s equivalent to exercise. They help improve cognition, memory, mood, and are being used in the treatment of many disease states, including Alzheimer’s dementia. “Sound” impressive? Too good to be true? How come we haven’t “heard” about them until recently? At least I hadn’t. I was first introduced to binaural beats by our hospital’s neurologist. He has been treating my dad for Alzheimer’s disease for a couple of years now. Only recently did I learn that the neuro PT that my dad is getting at his office is based on binaural beats and brain entrainment. The neurologist recommended that my dad get an app to do the therapy several times a day at home as well. Ever since he’s been doing the therapy, his cognitive testing has remained mostly stable with very slow decline over time, which was surprising and excellent news to me. My father’s Alzheimer’s disease had been on a rapid downward course and this was slowing it down. I didn’t know that there was something that could help actually improve cognition or slow its decline. So what are these beats about? There are different types of brain waves that are evident on an EEG depending on the state of the brain. When we are thinking and problem-solving, we are in a beta wave pattern. When we are overwhelmed with a million problems (like in the ED on a daily basis) we frequently go from beta into a “high beta” state. High beta brings out feelings of agitation, fear, and stress. Alpha waves states are associated with more calm, insightful periods of time, such as when we’re out for a calming walk or sitting at a campfire. Delta wave states occur when we’re in deep sleep. 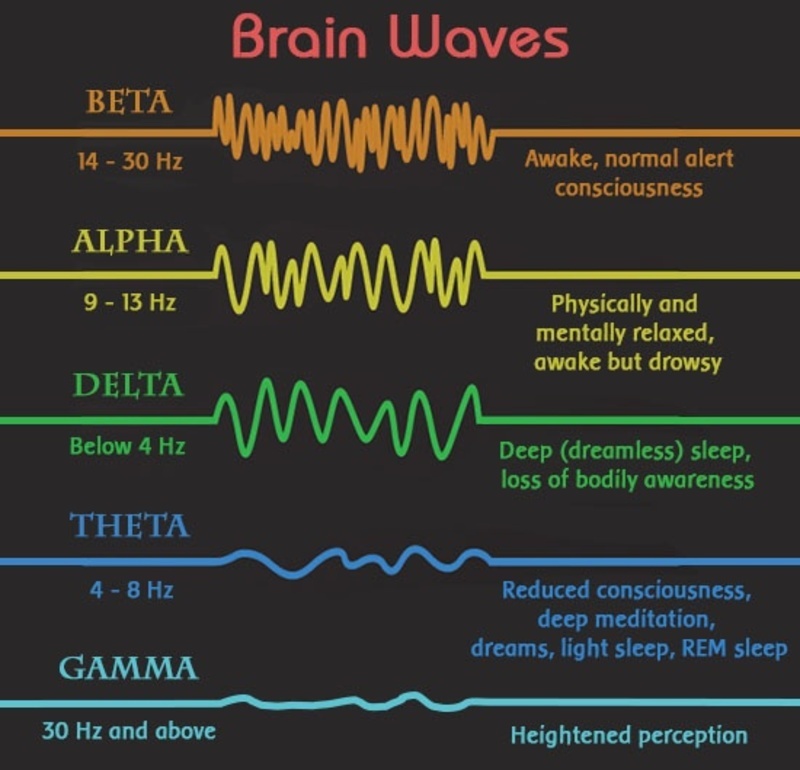 Theta states occur during deep meditation or REM sleep. Gamma states occur when you’re in “the zone;” it’s when athletes perceive that time slows down for them to make a play or when Buddhist monks meditate and reach another “realm” of perception. Meditation and mindfulness have been shown to reduce the high beta levels and allow the brain to function at a more relaxed rhythm. Meditation is typically thought of as a deep alpha or theta brain wave state. The more practice the brain has at being in a particular brain state, the more easily it can switch to that state at any given time. You can teach your brain to get into more relaxed brain waves via entrainment. Entrainment is the concept that neural pathways can work in a more synchronous way when exposed to a particular wave frequency over a period of time. In the same way that a repetitive activity results in improvement and learning (musicians, athletes, new drivers, stroke patients re-learning to walk) due to neuroplasticity, repetitive stimulation of particular brain wave states results in more easily achieved states in the future. An efficient way to externally expose the brain to a particular wave frequency is through binaural beats. Binaural beats were described by Dr. Gerald Oster in October 1973 in his Scientific American paper, “Auditory Beats in the Brain.” The concept is that when two different sound frequencies are introduced separately into each ear (for example, the left ear is presented a frequency of 400 Hz and right ear a frequency of 410 Hz) the brain detects the difference and resonates in both hemispheres at the frequency difference (10 Hz in this case, in the alpha wave spectrum). Why is this important, you ask? It turns out that being in more relaxed, meditative states at alpha and theta frequencies results in improved memory, mood, cognition, and has been linked to clinical improvements in patients (like my dad). You can help your brain get there faster (flex your proverbial “mental muscle”) by listening to binaural beats. Even better: meditate while listening to binaural beats!